10 days 'til Base Camp! One of my favorite things about being a Barker is that we create amazing opportunities for people to get into Mt. Hood National Forest. This summer we’re creating the biggest volunteer camp out ever, and you’re invited to join in! For four weeks, from August 2-15 and again from August 30 - September 12, Bark will be hosting Base Camp – an opportunity for folks to get to know us, learn about the unique ecology of Mt. Hood, get involved with our work to defend the forest, and enjoy this incredible place together. We will be camping in a free undeveloped campsite in the Upper Clackamas River watershed in Mt. Hood National Forest, near the proposed Hunter Timber Sale. 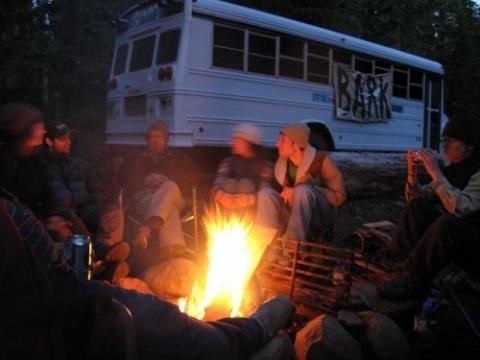 Campers will spend their days groundtruthing timber sales, exploring the upper reaches of the Clackamas, attending workshops from our friends and guests on a variety of topics. Base Camp is family friendly, so feel free to bring your kids and parents! Come for a day, a few days, or stay for two weeks. Let us know you’re interested in coming, and we'll send you important updates to prepare. Donate group camping supplies and food. Bark will provide breakfast and dinner each day, and we’re especially looking for fresh produce and other locally-sourced food. Here’s our wishlist.